How do i rotate is one of the most frequently asked questions for beginner Inkscape users. 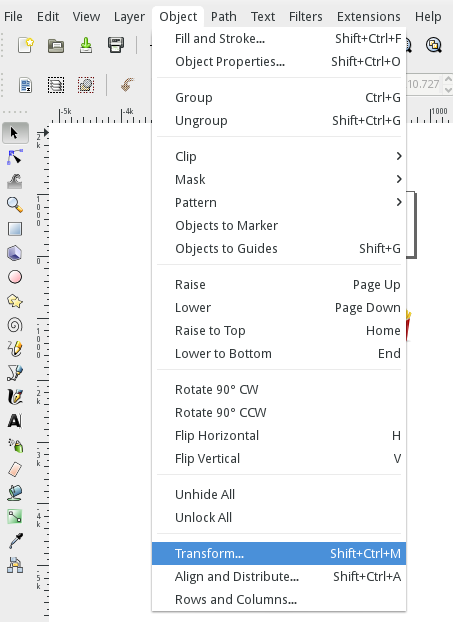 There are multiple ways to rotate in inkscape, and this FAQ will show you the basics for four of them. The three different ways for rotating objects are: the toolbar buttons, the on-canvas rotation handles, transform dialog, and the keyboard shortcuts. Finally, press the rotate button on the toolbar to rotate your selection in 90 degree increments. 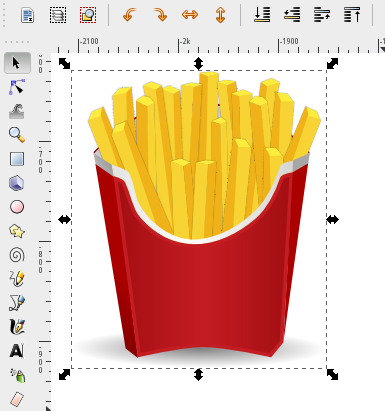 Using the toolbar buttons to rotate objects in inkscape is by far the easiest method to discover. However, it only lets you rotate in 90 degree increments. Now that the rotate handles are visible, simply click on one of them, and drag it to rotate your object freely. Method 3, the Transform dialog. The free rotate that the on-canvas rotate controls (method 2) give are great, but what if you need more accurate control? When using method 2, you can hold down the ctrl key to limit the rotation to 15 degree increments, but what if you want to rotate the object by a specific, arbitary amount? That is where the transform dialog comes in. First, as with the other methods, select the object that you want to rotate. Then open the transform dialog from the menu, Object > Transform. Switch to the “Rotate” tab of the newly opened Transform Dialog, enter in how many degrees you need your object rotated, and click apply to rotate. This method is super simple. Select the object(s) that you wish to rotate, and press the square brackets key( [ or ] ) to rotate left and right by chunks. For finer-grained rotation with the keyboard shortcuts, use the shortcuts alt + [ and alt + ] to rotate one degree at a time. The four methods above outline the basics of rotating objects in inkscape. For further information about rotating and transforming objects in Inkscape the “Select Tool” chapter of the Inkscape Manual has more detailed information, including how to change the rotation point or rotation center of your object. The transforms chapter of Tav’s Inkscape Guide also provides some in-depth documentation of rotating in Inkscape. Previous Previous post: Are we close to a release of the next version of Inkscape? Would it be possible to control the rotation with keyboard keys? I think it would be more accurate than the mouse when I need to rotate the object for just 1 or 0.5 degree. I have updated the post with details on Rotating Objects with keyboard shortcuts. I’d tell a little about the change of the rotation center in method 2 by dragging the cross. It is simple and could be useful – perhaps combined with the snap tools – to realize compositions with multiple copies of an object. That was a perfect explanation, thank you. Rotating in Inkscape is easy, but not obvious to a beginner, or someone like me with Illustrator ingrained in the mind. How do i undo a rotation of an object, i.e. set the angle to 0? Or even more general, how do i set the rotation anlge to a specific value? Many ways to rotate, but none of them is really useful if you want to work preceisely :-(. The above help was fantastic. I would have spent hours trying to discover this for myself. Is there any way to create a macro that will will rotate the image for you in the direction desired by a specified amount and save the result as a .png with sequential names? Then repeat until the image is back at the starting position? How do I know the angle of an object so that I can use the same angle to rotate some other object. be penalized or removed from the search engine listings fully. leave the job up to someone who does it for a living. Surgeons do everything that a physiucian does, plus surgery. require a medical degree. Not too imply that practitioners cannot get some things wrong, rather tjey ccould work on making tthe whole experience memorable. when creatin a polygon, how can I set the angle to 0°? Inkscape is GREAT. Thank You for making it available. I have only one problem with Inkscape, and this is rotating. For example, if you rotate a square, it becomes a rectangle. problem when I make a map of military battle. I just discovered inkscape a few weeks ago and love it so far and I just found your blog and its been really helpful. Thanks! How do you rotate the actual frame of the picture not just the object. How can I get the Rotate handles when the object is on top of another object? I can get the Move/Resize handles by holding the Alt key while clicking on the object, but nothing I have tried can switch to the Rotate handles; it just changes the selection to the object beneath the one I want.